Memo from Mission Control: San Antonio is currently contending to host the 2013 World Science Fiction Convention. If you’re a science fiction/fantasy fan in San Antonio and the surrounding area, this is hugely exciting news. Missions Unknown will be running periodic interviews with the people making the bid happen. The vote for the 2013 Worldcon’s location won’t happen until 2011, so this next two years of work will be critical to SA’s chances of winning the bid. Who knows — if you become involved, you might see yourself interviewed here in the not-too-distant future. Read, enjoy, get excited, and get involved. Let’s make this happen, SA. 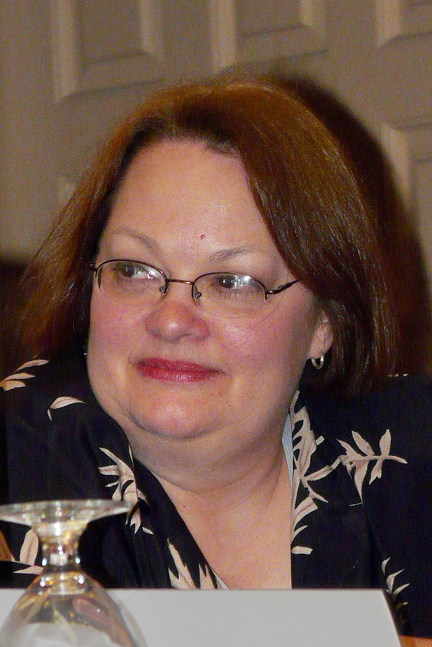 KAREN MESCHKE has been involved in Texas Fandom since before the 1985 North American Science Fiction Convention (held in Austin, TX), which was her first sf convention. Karen is an avid reader and behind-the-scenes organizer. She co-chaired ArmadilloCon X with Fred Duarte (1987), chaired ArmadilloCon XI (1988), chaired SerCon VI (1992), chaired Texas’s only World Science Fiction Convention (LoneStarCon II in 1997), co-chaired BoucherCon (World Mystery Convention) with Willie Siros (2002), chaired the late ConMisterio (2005 & 2006), played host to the 2008 Nebula Awards Weekend and is chairing this year’s SMOFcon in December in Austin. Karen has worked on a variety of conventions across the country in a variety of capacities. In addition to the above, Karen has served on the board of directors of the Fandom Association of Central Texas (FACT) and ALAMO in various officer positions in each organization. She has also twice served as an election judge for the Association of Science Fiction and Fantasy Artists (ASFA) and was the catalyst behind the FACT Reading Group, which began in 1994. The World Science Fiction Convention has been in existence since 1939 and is awarded to a different city every year. If someone has never attended one, what can they expect? WorldCon is a wonderful melding of all kinds of science fiction groups: readers, artists, publishers, costumers, gamers, media fans, anime fans and more. In short everyone has a connection to science fiction, and they come together to celebrate in that environment for three to five days as an extended family. You have authors reading and discussing their works, artists showing their craft, publishers showcasing their authors and book lines, gamers demonstrating their prowess with new players, media fans previewing unseen films and sharing the experience of classic films and shorts, panel discussions on everything imaginable and then some. The Hugo Awards Ceremony is held one night, as is the Masquerade on another; folks enjoy parties, whether said parties are in support of a particular bid or just to have fun. WorldCon can be sensory overload of the best kind, and an almost 24-hour-a-day full-throttle experience. A World Science Fiction Convention is very different from a San Diego Comic-Con or more media-driven conventions. What does a WorldCon offer that no other convention does? WorldCon is totally run by volunteers that change every year; this brings a fresh perspective to the program, venue and experience. While many fans volunteer each and every year; the variety of being in a new city adds to the enhancement of the event. The option for trying new formats is exciting to behold and each year attempts to out-do the previous. Also, it is a smaller more intimate affair for most, between four and six thousand people attend depending on the location; and this adds to the closeness of the attendees and the community that has been built over the past six decades. You’re on the bid committee seeking to bring the 2013 World Science Fiction Convention to San Antonio. You’ve also chaired a WorldCon and you’re a perennial attendee at WorldCon all over the globe. What keeps you coming back year after year? The people. I am taken aback by the number of wonderful memories that over the years I’ve received at WorldCon. Each WorldCon offers a different place to discover, and that can heavily influence the highlighted theme and scope of WorldCon. I enjoy going to the many author readings, watching the panel discussions between writers, publishers, artists, fans (many of whom who do not agree), wandering in the Art Show and experiencing all types of new ways to see the world, browsing in the Dealer’s Room and finding a book by the author I just heard speak or finding the long lost book I‘ve been searching for forever, sitting in the audience during the Hugo and Masquerade. I enjoy going out to eat at different restaurants. I like finding a comfortable sitting area and catching folks as they walk by to talk for a minute or an hour. What makes San Antonio’s bid unique and attractive to sf fans around the globe? San Antonio has always been one of my favorite cities; it has both old charm, and a new vitality. What a combination. San Antonio has one of the most varied cultural identities of any city with a rich tapestry of people not found anywhere else. The Riverwalk, the many old and new museums, art galleries, and assorted music venues make San Antonio a great place for WorldCon. San Antonio is also a gateway to South and Central America and I’d really like to explore the richness of science fiction, fantasy and magical realism offerings we could incorporate into a WorldCon. In 1997, when we held WorldCon in San Antonio, everyone had seen pictures of San Antonio, the Alamo, the Riverwalk, and outlying tourist destinations but when they came to experience the entire package they were enchanted by the whole environment, I’d like to see that happen again. San Antonio hosted the 1997 World Science Fiction Convention. The 2013 bid is a huge opportunity for San Antonio’s science fiction and fantasy fandom to unite. How can San Antonio science fiction and fantasy fans help ensure that the city wins the bid? Come to this year’s SMOFcon in Austin, meet many of the movers and shakers who have volunteered their time over the years at other WorldCons, show support for San Antonio, mingle with fans from around the world and let them know you support our bid. Attend other Texas and area conventions to meet and support other groups. If you are going to attend an sf convention outside of the state; take flyers, offer to work a bid table, or throw a party for us. Visit the website and support the bid for Texas in 2013. Come out and join the team. Attend the WorldCon in Reno in 2011. Help us convince voters to select San Antonio for 2013. This is where the actual vote for San Antonio will occur. If you cannot attend the WorldCon in Reno, purchase a supporting membership with Reno so that you can vote for WorldCon in 2013 in Texas. Attend your local convention or group gatherings and volunteer, meet other folks, talk us up to your friends around the country (and the world) if they would like to bring a WorldCon to Texas.